Why spend 2 points or more every meal for your beverage? Our Mug Club is not only good for the environment, it’s good for your points balance. If you go to either location 3 times a week, you will save over $75 this semester. Go 5 times a week and save over $140 this semester. Fewer than 80 mugs are available. Don’t wait! 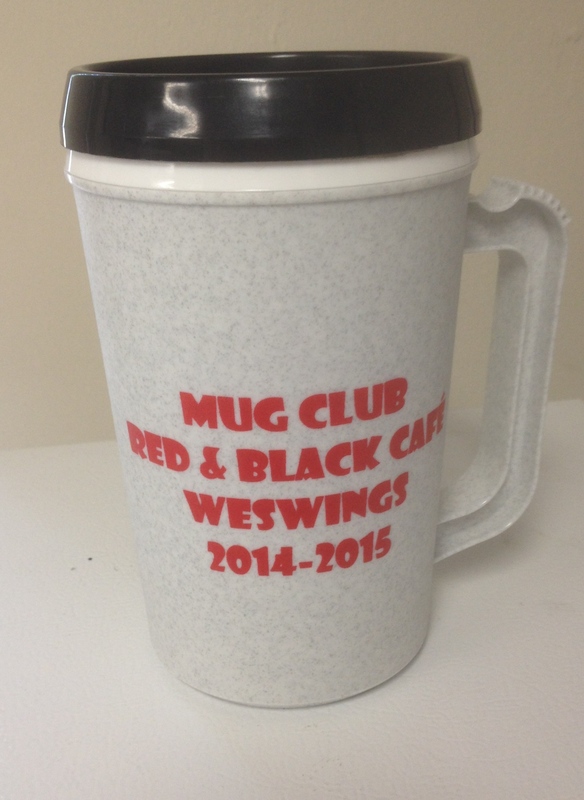 Purchase a reusable mug from either WesWings or Red & Black Café for free refills of soda and iced coffee every time you visit. Can I use it at other campus locations? Only WesWings and Red & Black Cafe. The mug is good until the end of the spring semester May 2015. What drinks can I get? Fountain soda and iced coffee. Bottled drinks, hot coffee, iced tea, chai and espresso drinks are not included. Do I have to purchase a drink every time to get a refill? No, there is only a one time fee of 40 22 points. After that, simply come to the counter and ask for your drink. How many times can I refill during a visit? To avoid people abusing the system and sharing with friends we technically limit to one refill per visit. We are often pretty flexible on this. Do I have to purchase anything else to get a free refill? Can I use a mug from a previous year? What do I do if I lose my mug? Don’t. You should write you name on it to help if it is lost. Like cash, you’re basically S.O.L if you do. How long are the mugs being sold? We have a limited number of mugs. Once they are sold, that’s it. This entry was posted in Red & Black Specials, Sustainability, WesWings Specials and tagged mug club, promotions by weswingsguy. Bookmark the permalink.